Chanteur Country US né le 19 Janvier 1937 à Winston Salem (Caroline du Nord), George Hamilton IV a débuté en 1956 chez Colonial et ABC-Paramount Records en chantant des ballades et en 1957, il s'essaie au Rockabilly. En 1959, il s'installe à Nashville (Tennessee) et signe avec RCA. George Hamilton IV, dont le Vocals est mélodieux, est surnommé l'ambassadeur de la Country Music. Vedette de Rock un peu par hasard, il assume aujourd'hui avec élégance sa véritable vocation de Country Singer. Proclaimed the International Ambassador of Country Music thanks to his performances around the world during the 1970s, George Hamilton IV began his career in the late '50s not as a country artist but as a teen-oriented pop star. After his first hit, "A Rose and a Baby Ruth," hit number six on the pop charts in 1956, he toured with Buddy Holly and the Everly Brothers but cracked the pop Top Ten only one more time. Instead, Hamilton moved to the country charts by 1959, where nine of his hits spent time in the Top Ten, including his only number one, "Abilene." Though he began in pop, Hamilton's primary interest in country music stretched back all the way to his hometown of Winston-Salem, North Carolina. Born July 19, 1937, George Hamilton IV was raised on the Westerns of Gene Autry and began playing guitar at the age of 12. He formed a country band in high school and while still a freshman at the University of South Carolina, he met John D. Loudermilk, then a struggling songwriter. 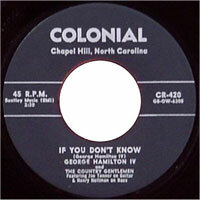 With a contract in hand from the Colonial label, Hamilton recorded "A Rose and a Baby Ruth," Loudermilk's attempt at approximating rockabilly music. The single did well regionally during 1956, and was picked up by ABC-Paramount later that year. After it hit number six on the pop charts, ABC signed Hamilton to a regular contract. Somewhat uncomfortable on the pop charts, Hamilton never equalled the success of "A Rose and a Baby Ruth." The 1957 single "Why Don't They Understand" barely made the Top Ten, and his 1958 inspirational record The Teen Commandments -- recorded with Paul Anka and Johnny Nash -- stalled at number 29. After appearing on The Jimmy Dean Show during 1957-1958, Hamilton was given his own show by ABC-TV in 1959; it ended before the year was out. After the failure of his own show, Hamilton joined the Grand Ole Opry in 1959, making his claim to country audiences more sincere by not affecting the Western trappings of most country artists. 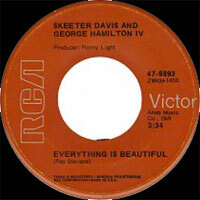 His first entry on the country charts ("Before This Day Ends") made number four in late 1960. One year later, Hamilton was signed to RCA Victor by Chet Atkins. After Top Ten entries in 1961 ("Three Steps to the Phone [Millions of Miles]") and 1962 ("If You Don't Know I Ain't Gonna Tell You"), Hamilton hit it big in 1963 with "Abilene." The single, his second to be written by John D. Loudermilk, topped the country charts for four weeks in June and crossed over to number 15 on the pop charts. 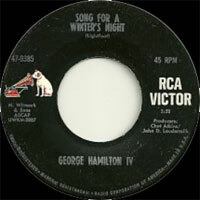 During 1964, Hamilton charted three singles and returned to the Top Ten with "Fort Worth, Dallas or Houston." Increasingly inspired by folk music during 1965, Hamilton began recording the songs of Gordon Lightfoot; both "Steel Rail Blues" and "Early Morning Rain" hit the country Top 15 during 1966, and Hamilton went on to record more Gordon Lightfoot songs than any other artist. "Urge for Going" (written by another folkie, Joni Mitchell) hit number seven in 1967 and "Break My Mind" did the single one better later in the year. He continued to record for RCA until 1974, but chart success largely eluded him -- except for the number-three hit "She's a Little Bit Country" in 1970. 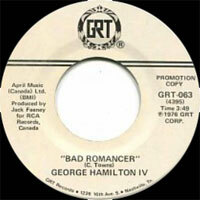 Undaunted by his lack of domestic success, Hamilton took country music around the world during the '70s. Besides more than ten tours of Great Britain and several BBC-TV productions, he hosted the Gospel Celebration and the International Country Festival, both of which were held in England. In 1973, he organized the longest international tour ever by a country artist, doing 73 shows over a period of three months. One year later, Hamilton became the first country artist to perform behind the Iron Curtain, where he lectured about country music as well as playing shows (one Czechoslovakian concert even featured a Czech country group backing him). Besides Europe, he toured Africa, the Orient, New Zealand, Australia, and even the Middle East during the late '70s. 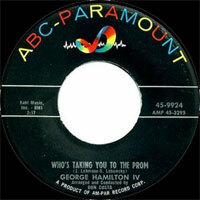 Signed to ABC-Dot in 1976, Hamilton just barely made the country charts several times during 1977-1978. Since then, he has concentrated on gospel recordings, for both Word and Lion & Lamb. 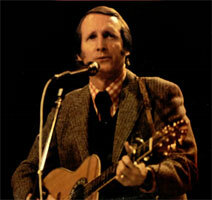 His son, George Hamilton V, toured with his father's backup band and charted a single during 1988. 1990 ? SP Colonial LR-10177 (US) .